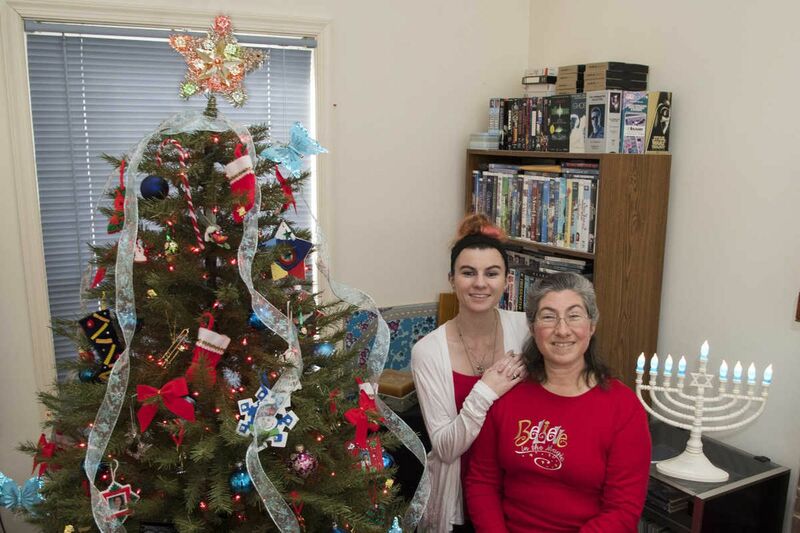 Diane Featherman and her daughter Jordynn are Catholic and celebrate Christmas. Featherman’s husband and son are Jewish and celebrate Hanukkah. Their Exton home is decorated for both holidays. Saturday will be a busy night for Felise and Mark Shellenberger and their two daughters. First, the Upper Dublin family will light a menorah, as it's the first night of Hanukkah, the Jewish festival of lights. Then, they'll have their customary Jewish-on-Christmas-Eve Chinese food dinner. And finally, they'll go to Mark's mother's church for the evening Christmas carol service. It's a once-in-a-generation scramble for thousands of interfaith families in the region, as Christmas Eve and the first night of Hanukkah fall concurrent for the first time since 1978. That means celebratory mash-ups of all sorts as two beloved holidays are compressed into a single, 24-hour whirlwind of candles and carols, presents and potato pancakes, gelt and (that Judeo-Christian unifier) guilt. Some families will mix-and-match favorite customs; others will try to preserve two distinct religious practices. Still others will toss out tradition with the torn wrapping paper in favor of creating new and whimsical modes of holiday celebration. Such innovations are on the rise: According to a 2013 Pew Research Center report, "A Portrait of Jewish Americans," 58 percent of Jewish people who have married since 2005 have non-Jewish partners. (Compare that with just 17 percent of Jews who married before 1970.) About 40 percent of those couples are raising their kids partly Jewish - either by religion or by secular, cultural affiliation. The cause of this year's pileup is dueling calendar systems. Hanukkah tracks the Jewish lunar calendar, so it's liable to drift back and forth along the Gregorian solar calendar from one year to the next, sometimes threatening to invade New Year's; other times crowding Black Friday (see: 2013's once-in-a-century Thanksgivukkah). Robyn Frisch, director of InterfaithFamily/Philadelphia, said her organization began planning around the rare convergence in January. She sees it as an educational opportunity. Frisch doesn't care for the phrase often used to describe such negotiations: "the December dilemma." "We call it a December dialogue," she said. "The actual story of Jesus being born and the Hanukkah story of the light lasting for eight days are very different, but both of these holidays celebrate the idea of bringing light to the world in a dark time of year," said Frisch, who's also a rabbi at Temple Menorah Keneseth Chai in Northeast Philadelphia. "The overarching value is something all people, no matter their faith, maybe can share." Still, it's something of a dilemma for Diane Featherman of Exton. She and her husband, Scott, introduced their children to both of their religions: Their two daughters veered toward Catholicism, while their son had both a confirmation and a bar mitzvah. And, each year, in addition to (but in a separate room from) her Christmas tree, Diane sets up what she calls a Hanukkah bush, decorated with a Star of David, blue-and-white garland, and a stuffed dreidel on top. The trouble is, some extended family members don't like to see the holidays integrated. "To keep things on the smooth side, we just keep the families separate," she said. But, with the holidays coinciding, "It makes it a little more hectic." Others don't see it that way. The Shellenbergers - who founded a study and prayer group called Interfaith Families of Greater Philadelphia - are used to acknowledging both religions at once. They simply bring their menorahs with them if they're attending Christmas celebrations elsewhere. Kevin Gillen, a practicing Catholic in a Jewish household in Mount Airy, will slip away to midnight Mass after lighting a menorah and making latkes with his wife and daughter. On Christmas morning, he said, "I'm not allowed to have a tree, but I take the dog to the park in the morning and I'll break a branch of a pine tree and put presents under that. Although the 4-year-old is being raised Jewish, she doesn't seem to object to a pile of presents." And, he's found, his family's traditional Polish Christmas dinner has crossover appeal. "Kielbasa, pierogi, and latkes all go wonderfully together." That outlook is becoming more common, according to Susan Katz Miller, the Maryland-based author of Being Both: Embracing Two Religions in One Interfaith family. "What I see this season is interfaith families really claiming joy," she said. She said millennials in particular are rejecting religious institutions that dictate celebrating in one way or another. "For many of us, being part of an interfaith family inspires bridge-building and peacemaking. This year, the fact that Hanukkah begins on Christmas has brought all of that into relief," she said. She sees secular families are blending traditions at will: decorating Hanukkah cookies, hanging dreidels on the tree, or putting blue and white decorations on wreaths. More religious families are keeping celebrations separate even if they are on the same day - or saving Hanukkah festivities for later in the eight-day festival. She advises seizing the chance to emphasize the differences between the holidays - and maybe even cut back on gift-giving, a relatively new tradition for Hanukkah, which is actually a minor Jewish holiday. Or, you can abandon that history in favor of something new. Lox in a Box, a vacuum-packed smoked salmon with a hand-drawn smiley face ("Yes, he should be refrigerated," Joel said) and a rich backstory (he summers in Brooklyn). The Mayers' three kids wake up each morning throughout the holidays to find the duo zip-lining, recovering from a snowball fight, or speed-dating Barbies. Recently, the elf donned a Trumpian wig and built a wall across the dining room. On Saturday night, the plan is simple, Joel Mayer said: "We'll light the candle. We'll blast Adam Sandler's 'Hanukkah Song.' The kids will open their Hanukkah presents for the night - and then we'll try to get them to bed so we can set up the Christmas presents." It's a lot of work, and a lot of presents: Christmas gifts for all three children plus a Hanukkah gift each for eight nights. For Mayer, it's about making both Hanukkah and Christmas equally joyful and festive. "We're celebrating both holidays: They're not competing, and we don't want [our kids] to feel as if there's a time that they conflict with one another. This year will give us a great opportunity to really live that."